Meyer Harris (Michael) Cohen was born in 1913 in the rough and tumble section of Brooklyn known as Brownsville before the little guy was whisked away by his parents and landed in Los Angeles by the age of six. While Cohen's contribution to Jewish Gangster lore doesn't really fit into the framework for this particular project, his exploits and ties were still wound tightly enough with the New York based mob early on. Cohen was pint-sized at 5' 5", but stood tall and had bigger matzoh balls than most. After a brief foray as a semi-pro boxer, his fists and Star of David stitched shorts led him to small time thuggery, racketeering, robbery, and bootlegging by the time he found himself in Chicago during Prohibition and operating with outside satellites of the Al Capone gang. By the mid-30s Meyer Lansky sent Cohen back home to Los Angeles to keep an eye out on Bugsy Siegel when the syndicate sent the blue-eyed one out west to set up shop. Cohen was at Siegel's side as de facto bodyguard for a good part of Benny's west coast days and partnered in the building of the Flamingo Hotel. After Siegel's bullet riddled demise on a warm night in June of 1947, the city of Angels' underworld was suddenly in the Mickster's hands. Meyer Lansky's number one rule was to stay out of the papers. 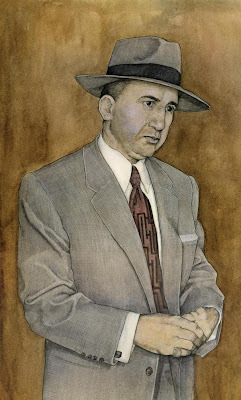 Mickey Cohen was not so fond of that rule. His exploits in Los Angeles read like the best headlines taken from the pages of Hush Hush and Confidential magazines. He hobnobbed as easily with movie stars and strippers as he did with the oily haired slicksters of the LA underworld, becoming Hollywood's first bona fide celebrity gangster while dodging bullets and bombing attempts. The mainstream press was fascinated as well. Life magazine in 1950 ran a photo essay on him at his Brentwood home, depicting him as 'just a, albeit colorful, normal post war suburban' to middle America. Despite his size and former boxer mug, he still managed to be an impressive catch when it came to the ladies as well; for those looking for a little spice in their love life the dangerous little bulldog seemed to be the most exciting thing on the Sunset Strip. The real deal. Cohen eventually served time for tax evasion twice; once at the hands of the Kefauver Commission hearings and again in 1961 where he was sent to Alcatraz. In later life, he made the rounds of the talk show circuit as the old time mob's (unwanted) mouthpiece. Mickey couldn't help himself as he loved the limelight and attention, and by then the ol' hucktser's hands were relatively clean enough to not do any real damage at top levels, just another aging gangster with tales of the good ol' days of bullets and broads. He quietly slipped away in his sleep in 1976.